Mary had not confessed to any crime. The evidence that led to her death came from her intercepted letters. Other letters implicating Mary in the murder of her second husband had led to a cold reception when she first arrived in England. Both cases give an insight into how insecure communication is by no means a modern worry – even if, hopefully, having your emails and Facebook posts read today doesn’t lead to an executioner’s axe. Allegedly, the letters were written by Mary to James Hepburn, Earl of Bothwell. Intimate letters from a married woman to a man not her husband might have caused a minor kerfuffle. But letters asking why he hadn’t yet had her husband killed painted Mary as treacherous and dangerous. The fact that Henry Stuart, Mary’s husband had been blown to pieces shortly after the letters were (allegedly) written, and that Bothwell was widely suspected seemed to show her as an eager and cold-blooded accomplice to murder. Reconstruction of Sheffield Manor, where, along with the now destroyed Sheffield Castle, Mary, Queen of Scots was detained for fourteen years. Their impact was undoubted. Mary was detained in various castles and country houses around England. In her absence, relations between newly Protestant Scotland and England grew much warmer. Unable to return to Scotland and prevented from leaving for Europe, as the years passed Mary became an inconvenience – and a threat. 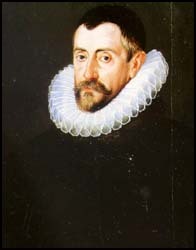 Most frustrated was Sir Francis Walsingham, one of Elizabeth’s closest advisers – and spymaster. At the centre of a web of agents and informers, he was convinced that Mary was a dangerous threat. Strong circumstantial information pointed to her involvement in the Throckmorton Plot of 1583, a plan for the French duke of Guise to invade England with Spanish support. But no compelling evidence was found.What was needed was written proof. Walsingham’s spies brought him reports in early 1586 that more secret plans to rescue Mary were afoot, headed by Anthony Babington a minor Catholic nobleman. Determined not to be foiled again, Walsingham ensured that well placed agents were in position in Mary’s household. One of these, double agent Gilbert Gifford, arranged for Mary to be able to communicate with her supporters by letters smuggled in beer barrels into and out of the house where she was detained. The letters, of course, were closely monitored by Walsingham’s men. The coded messages were removed from the barrels, deciphered by experienced forger and gifted linguist Thomas Phelippes, copied and then allowed to reach the intended original recipients. Having set up the system to read all outgoing and incoming mail, it was only a matter of waiting for something to happen. Intercepted letter from Mary Queen of Scots. 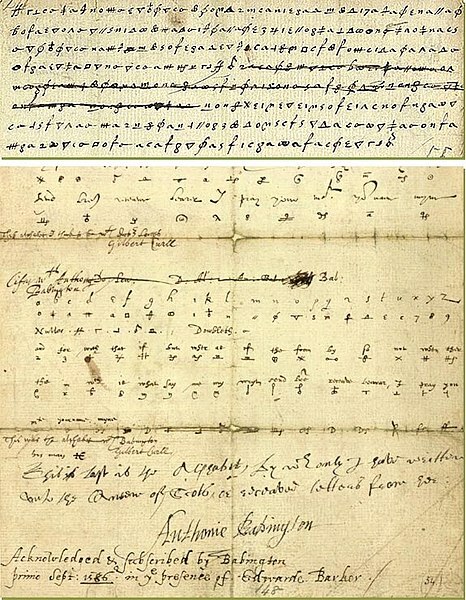 Deciphered by Thomas Phelippes, an expert forger, he also added a postscript seeking the names of Babington’s accomplices. By writing these words clearly encouraging and endorsing a plan to kill Queen Elizabeth, Mary had signed her own death warrant. Walsingham used the letter to finally convince his monarch to allow her troublesome cousin to be executed. Babington and his associates were arrested in August 1586. All were interrogated and confessed – most likely after torture. Mary’s death followed five months later. The question remains whether she and Babington were really guilty? Supporters and defenders have suggested that the entire affair was designed, propelled and controlled by Walsingham. Without his agents in place facilitating communication, nothing could have happened, there could have been no plot. Constant surveillance of every message ensured there was no danger – or more accurately only what danger Walsingham and his agents allowed to happen in letting the scheme build to the point where there was sufficient proof against Mary to bring about her death. Was the entire affair a case of entrapment engineered to entice the unwary into planning crimes they would never otherwise have thought of no less embarked upon? Or, to bring these issues into the modern context, does it matter who’s reading, conveying and receiving your messages if you have nothing to hide? Was it Walsingham’s duty in 1586 to flush out potential threats and radicalising plotters by whatever means possible? Was England spared an invasion and bloody conflict through surveillance of communication? The NSA PRISM Program which dominated the news this week and brought suggestions of a ‘turnkey totalitarian state’ in the offing. Or where does the line between finding and creating threats lie? Is it permissible to alter emails, Facebook posts, and Tweets in the fashion that Walsingham’s agents manipulated Mary and Babington’s correspondence? Even a little for the sake of greater safety for all? If you’re innocent of any crime does any of this matter? Then again, online are we innocent until proven guilty? Or guilty until proven innocent? Previously this was usually between you and your conscience. Now, it may be up to you and the NSA to determine. This entry was posted in History, Politics, Ruminations and tagged Beer, Elizabeth I, England, Espionage, Francis Walsingham, History, intelligence, Mary Queen of Scots, PRISM, Renaissance, Surveillance by Tom Byrne. Bookmark the permalink.